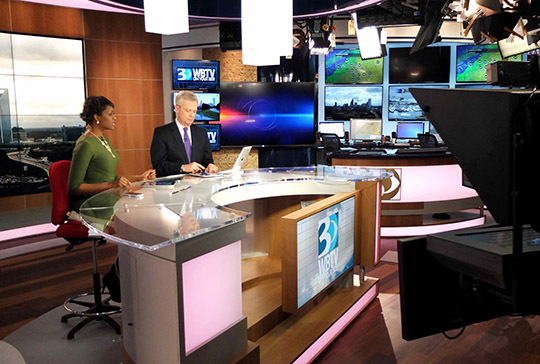 WBTV-TV, the Raycom CBS station in Charlotte, N.C. is sporting a new look this sweeps period. 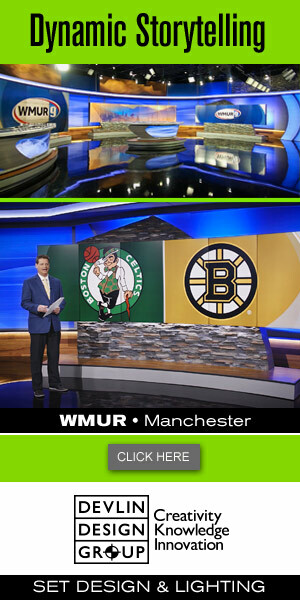 The new set, from FX Design Group, features a large 6×4 NEC curved video wall and U-shaped anchor desk, as well as plenty of color changing backlit accents. The overall design is warm and inviting, while combining the latest in technology. The curved video wall, which is a design trend popping up in more and more sets, including, perhaps most similarly, at Dallas’ Jack Morton PDG-designed KXAS-TV, is used to show live video feeds and graphics and serves as the main anchor background. 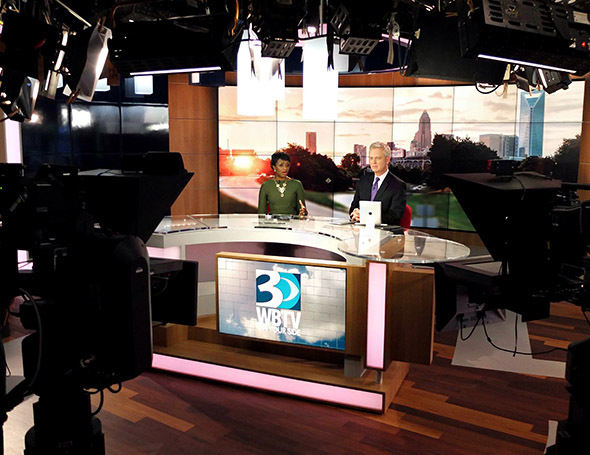 The array is controlled through TV One’s CORIO Master Mini video system. 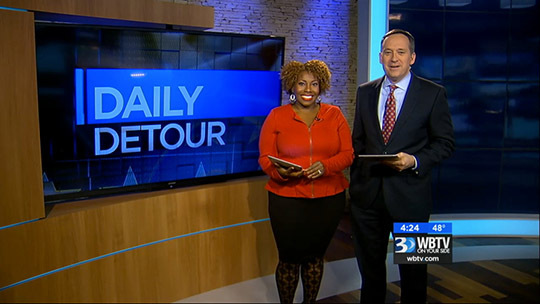 The new look also includes a large working weather center, which is separated from the main anchor desk by a 90-inch wall mounted OTS monitor near a stack of three smaller screens. 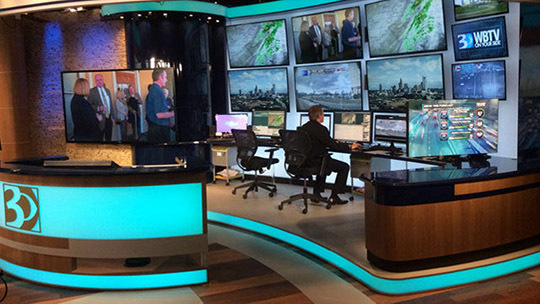 The weather center itself is stocked with six 55-inch Sharp monitors and features a curved, backlit work and presentation desk that can change color with the rest of the set. A 46-inch NEC monitor is on the far right edge of the weather center and is used for traffic. To the left of the anchor desk is a standup area which includes an 80-inch monitor and some faux stonework. Design wise, color changing technology has also been incorporated into the set headers and risers. For portions of the set not covered with color changing backlit walls, either a medium-toned wood finish or a glossy black surface which, interestingly, reflects much of the studio lighting and equipment, is used. The set also includes hanging internally lit lanterns — similar to those seen on many sets designed for NBC News by Clickspring Design. The station also switched to the new Raycom Media standard graphics package with the upgrade.